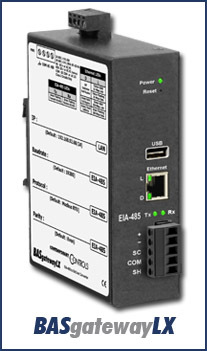 March 2013 – Released last fall, the BASgatewayLX has proven to be a quick and easy way of integrating Modbus devices into a BACnet internetwork. It is easy because our sales manager, Joe Stasiek, does all the work in developing the required Modbus device profiles. One is required for each Modbus product such as an energy meter or boiler controller to be connected. He receives requests for particular product models that are being integrated and does his best in interpreting the manufacturer's Modbus register list and then matching the registers to BACnet objects. Once a device profile is developed, it is added to our library on our website for all to use. The system integrator downloads the specific device profile into the BASgatewayLX and checks off only those registers needed to be scanned. Up to 30 Modbus devices - the same type or different - can be scanned by each BASgatewayLX using a technique call virtual routing. Each connected Modbus device appears as a virtual BACnet device. Up to 1000 registers can be marked for scanning. It is simple and effective. However, we have received requests from system integrators and OEMs asking for the capability to make their own profiles or to be able to modify profiles in the field. One issue we run into is when we need to connect directly to an input/output module on a PLC where we are given no definition as to the significance of each PLC I/O point. In this situation there is no specific device profile we can develop because each point is programmable but that does not mean one cannot be developed in the field once programming is completed. Currently, we have no profile builder tool except for the one we developed for in-house use. Therefore we decided to provide a 20-page application note that defines the data format we use when developing device profiles. This application note is available for download to those who want to know the gory details. For those who want the easier approach, you can still call Joe to do the work for you.